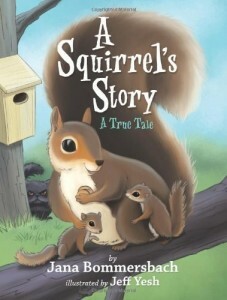 A Squirrel’s Story: A True Tale is one of the best books for use in the 3rd or 4th grade classroom because of both the fun story line and the facts about squirrels the reader will absorb. Teachers and parents will enjoy following the mama squirrel as she raises her babies and teaches them the values and the character traits that they will need to grow into responsible adult squirrels. Student readers will be able to master the reading independently, but as a classroom addition to science and biology, this book will also work great as a group story. The author has taken observations about squirrel activity to weave a story about how a parent teaches a young one how to be independent, gain confidence, and be nurtured to healthy growth and development by telling The Squirrel’s Story. The author has done an excellent job with additional classroom activities in the last few pages of the book. The curriculum guide includes third grade vocabulary words and exploration, creative language activities, and writing guidelines. Also included for readers is a word matching game. Teachers are encouraged to allow students to be the reporter, the poet, or the researcher and to discover how to write their own true story based on observations. Art is an extra bonus activity included in the curriculum addendum and teachers and parents will enjoy adding this to the fun when reading and teaching this book. The author offers several online sites for more activities and information to enhance the student. Activities address both visual and auditory learners making this book a great addition to the classroom. Other books by the publisher can be found at www.eStarPublish.com and specific additional information on this book can be found at the website www.SquirrelsStory.com. Warning: Do not read this review before breakfast! Or any other meal for that matter! This is a warning that should also be applied to Michael Rosen’s latest book, which more than delivers on the title Strange Foods. Part of the “No Way” series, Strange Foods gives readers a taste for bird spit (in Bird Nest Soup, a Chinese delicacy), maggots (in Casu Marzu, Sardinian cheese that tastes like ammonia and smells like a stink bomb), jellyfish (in Echizen Kurage, a Japanese Candy), and cat poo (in Kopi Luwak, a coffee made from beans that have been partially digested by an Asian Marsupial). And if that’s not enough – how about some poison on the side? 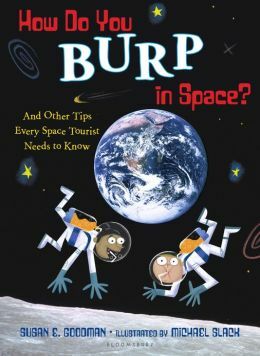 This book dishes it up in tiger blowfish, which contains enough tertodotoxin to “pleasantly” numb your lips and tongue. But if you eat too much of this Japanese dish you can experience dizziness, exhaustion, nausea and muscle paralysis that can lead to death! 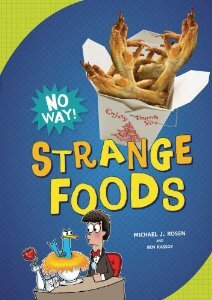 Strange Foods also introduces readers to mithridatism, the practice of ingesting small amounts of poison to build up immunity to snake bites, poison ivy encounters and attempted assassinations in the case of one Turkish King. There is a glossary at the end to increase the third grade readers comprehension and source notes to help readers get more information. All this makes Strange Foods an essential addition to the non-fiction library. But it is a book that’s best kept out of the kitchen. Otherwise, you just might start getting requests for chicken feet, pig hooves, or giant water bug soup! Everything you need to know about going into space. Space tourism isn’t here yet but here is a travel guide for when vacationing in outer space is a reality. There is advice about what to pack and the best time to go with a special warning to go healthy because medical issues are difficult to deal with in space. There is a section about what sensations to expect from your trip and how time is measured there, what weightlessness feels like and how important it is to exercise. Bedrooms, bathrooms and eating must be modified in microgravity. No soda in outer space because in microgravity, when the carbonation is released from the stomach, so is everything else. Some of the best sightseeing in outer space is looking at the Earth but no trip off-world is complete without a side trip to the moon. Until the resorts are built, you’ll stay on your orbiting ship and shuttle down to the moon’s surface. Once back home, you may have a few effects from your trip such as getting used to gravity again, but these are minor compared to the thrill of telling your friends about outer space! A delightful presentation about space travel. There are quotes from the astronauts along with funny fact boxes such as tips and travel alerts. The illustrations are cartoon characters or photographs enhanced with those characters. Even though it is a spoof of guidebooks, a lot of good information is included. Extra material includes a section about gravity, a glossary, a space exploration time line, further reading, internet sites and an index. This would be a good class read aloud, a demonstration of writing in second person. Using the book as a guide, students could make a brochure about space travel as a literacy activity. Chihuahuas have been featured a lot in children’s fiction – for good reason. There is just something about their small size and pointy ears that make us want to know what they are up to and join in their fun. The Adventures of Bella and Harry series is no different. Because it is told through the eyes of two Chihuahua siblings, children of all ages will eagerly gobble up a big dose of geography without even realizing it’s good for them. Book nine, Let’s Visit Istanbul, does a great job of introducing first through third grade readers to the culture, history, and geography of Istanbul, Turkey. 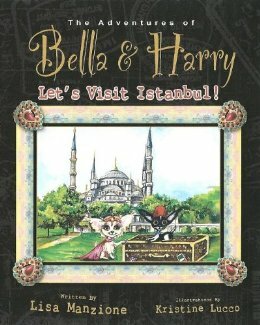 Following Bella and Harry through a day of travel, readers experience everything from the food they eat for breakfast, to the dizzying number of historic buildings they visit, to the sights and the smells of The Grand Bazaar, one of the oldest and biggest covered markets in the world. The story is told mostly in stilted dialogue that is not exactly realistic (but then again, these are talking dogs!) Bella, the older sister, speaks very much like a travel guide. But Harry, the younger brother, mixes things up and adds some humor by suggesting games of tag and sharing his dream of flying on a magic carpet. It is not the writing that makes this book work, it is the design and the beautiful illustrations by Kristine Lucco that incorporates detail not included in the text, such as the Turkish flag and the clothing worn by the locals. At the end, there are several pages that also provide additional information. “Fun Turkish Words and Phrases” defines important words like ‘please’ and ‘yes’ along with the all important phrases ‘girl dog’ and ‘boy dog’. “Our Adventures in Turkey” shows snapshot pictures of Turkish jewelry, dancing, and other cities within the country. To accompany the series, author and publisher Lisa Manzione has put together a wonderful website, www.bellaandharry.com. There are reading activities such as “Pack Bag”, “Word Match” and “Flag Match”. There are also lesson plans and teacher guides for the first six books in the series. With the release of four books in 2013, including Let’s Visit Istanbul, and the planned release of four more titles in 2014, this is a series that will continue to gain momentum. It has already received several awards and is the basis for a musical that is now on tour. Get ready world – here comes Bella and Harry! We are told in the first book of the Nikki and Deja series that they are the best of friends. As in all satisfying series we see their friendship ripening as they grow in understanding. Deja understands her friend’s love of words, she is going to be a journalist after all, and does not hesitate to ask for help when writing notes and letters. This book is so suited to second and third graders, themselves living through the experience described in the stories. Substitute teachers are a fact of life. Teachers fall sick, or have other commitments, and have to take time off. Substitute teachers who cannot handle the classroom very well, and children taking advantage of their timidity are also a fact of life. The story takes off from there. Deja and Nikki write the letter and succeed in getting it to Mr. Willow anonymously. Are they prepared for the consequences? Do they even imagine what one simple, helpful letter would lead to? The unknown adds an element of mystery that young readers would enjoy. As would the teachers. 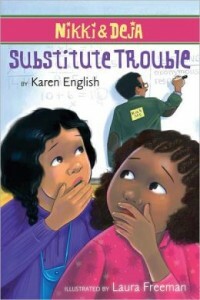 The story gives an easy lead into talking about classroom behavior when there is a substitute. This is a short chapter book that can lead to many reading activities and discussion points, a book and a series that would grace any classroom reading list. Animal Tales is a lovely collection of short stories, perfect for reading aloud to the third grade crowd. Each tale is filled with humor, absurdity, and lessons with a careful delivery that will appeal to readers of all ages. “The Frog That Found A Fortune” is about a nervous little frog who finds what he believes to be a long lost diamond from the Crown of England. Readers are taken on a wild ride as the frog imagines himself being rewarded for it’s return with barrow loads of slugs that lead him to become a virtual slug baron. But then, as frog starts to worry about all the barriers that might stand in the way of getting the diamond back to Buckingham Palace, a magpie steals the precious jewel forcing the unusually sensible frog to realize that life is good in his lovely, damp hedge and that the magpie has just saved him a whole lot of trouble. Written as legends in a wonderful story-telling voice that often addresses the reader, these Animals Tales are made to be shared. The morals and lessons presented in each story are multi-faceted and complex, lending themselves to vibrant post-read discussion. Not all the endings are happy. Not all the messages are direct. But every story begs to be explored. In addition to giving readers something to think about and enhancing comprehension, the stories help boost vocabulary with the seamless insertion of words such as IGNONIMY and INSATIABLE. North American readers will also be introduced to British expressions such as trousers and petrol. The stories are dispersed with lovely anthropomorphic pictures. My favorite is the image of badger (an old, misunderstood war hero) teetering on a ladder above his store with an array of groceries and bratty kids shown in delightful detail below. Similar pictures accompany the paragraph long “Wonders of the Animal Kingdom” captions (The Transylvanian Limping Bat, Electric Wombats, Money Salamanders, The Fake Elk, Bendy Giraffes, The Mongolian Deep Fried Bat.. ) which read like news editorials, spoof ads and short entries from an animal encyclopedia of the absurd. There is truly something for everyone in this wonderful collection, with laugh out loud outrageousness that will have kids rolling with laughter to clever humor that adults will find difficult to explain. 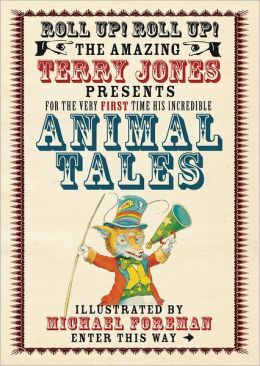 “The Amazing Terry Jones Presents…” includes two other titles, Fairy Tales and Fantastic Stories, that are also available in hardback and ebook – equally perfect for the classroom or sitting around the campfire. 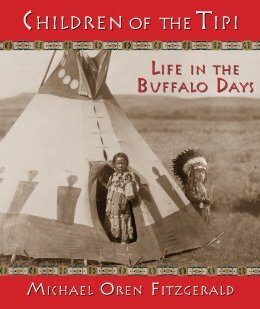 A book of photos and quotes, the superb layout allows you to sneak into the camp with the Native American’s shown. We see mothers and babies, women working on beading, children playing with dolls and small bow and arrows. Children will be rightly fascinated by children of another era and another culture — children who had to learn to hunt and fish, and yet played with familiar toys of dolls and balls. These are snippets from many individuals in many tribes about many different topics and Fitzgerald points out that the individual talking represents only him or herself. Students might need to be reminded to be careful about generalization from one quote, but this is a minor quibble for a powerful and charming book. Since most of the power comes from the pictures, the book is appropriate for pre-kindergarten, kindergarteners, and first graders. Second and third graders can probably read it for themselves. It is also a lovely book for fourth grade and above to page through and read, especially when students study their home state and learn about local Native Americans. Getting third grade children interested in history is not always easy. Mister and Lady Day has done an excellent job of grabbing the attention of young animal lovers and teaching them a little bit about the history of jazz. Billie Holiday, or Lady Day, had many dogs, big ones and little ones, pure bred and “mutt”. She loved her dogs. But she did have a favorite. Mister, her favorite, was with her almost all of the time. She cooked for him and even made sweaters for him. He loved her and protected her. Lady Day “had to leave home for a year and a day”. She did not sing for that entire time because she was so sad to be away from Mister. She worried that he would not remember her. But he did! She began to sing again and on the night of her biggest show Mister was right where he always was when she was on stage, waiting in the wings. What a wonderful way to integrate music and history into literacy. This sweet story of the bond between Lady and Mister is an easy read. The lovely illustrations help with comprehension for words such as “Chihuahuas”. A picture walk for younger children would be a walk in the park with this book. Learning about history and music is great. However, there are social/family aspects that are much more subtle. The text of the book does not tell why Lady Day “had to leave home for a year and a day”. An author’s note at the end of the book tell that this time away was due to a prison stay for drug possession. When teaching about the problems associated with drugs, children can more easily relate to being separated from a beloved pet than to the seemingly abstract notion that they might go to prison. Then there is the reality that some children have parents (or siblings) who are away for a variety of reasons; military service, divorce, prison. This book can help them understand that even though their loved one is gone, they are still much loved and not forgotten. 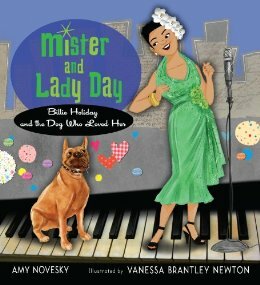 Amy Novesky (http://www.amynovesky.com/Amy_Novesky/author.html) and Vanessa Brantley Newton (http://oohlaladesignstudio.blogspot.com/) have done a masterful job of blending their talents to create this precious story of the loving bond between Lady Day and Mister. Be sure to visit their websites to learn more about these talented women and their other works. Emma’s family had the very best nanny ever! Emma and her four siblings adored Annie. What a shock when they found out, at almost the same time, that not only was Mom having another baby, but Annie was getting married. Whatever would Emma do? Where would she and her older brother Tim go when they were worried or scared? Annie had always welcomed them into her upstairs apartment at such times. Because Emma’s parents had offered to have Annie’s wedding in their home, Emma had to wait to paint her room the wonderful, electric blue color she had picked out. Two days before Annie’s family was due to arrive from Ireland, Emma decided to turn her closet into a “safe place”, somewhere to go when she was scared or worried. The first step was to paint it. Her parents had said she could not paint her room, but did not say anything about her closet. The next morning Mom and Dad found out about Emma’s middle of the night paint job when they found puppy paw prints all over the new floor in the entryway. What a horrible dilemma! The wedding was just two days away. It was going to cost thousands of dollars to fix the floors, but they could not be fixed before the wedding. Emma finally remembered the paint remover the vet had used to get the paint off of Woof’s feet when they took Woof and Marmaduke, Emma’s pet ferret, to the vet. She tried that on the floor and it worked! Now the house would look perfect for the wedding. Ah, the wedding. It was glorious. When Emma saw how happy Annie was she knew that “everything was going to be all, all right”. This sweet story would make a wonderful read aloud in a third grade classroom. There are many prediction, problem solving, and vocabulary possibilities. What will the family do if Annie moves out of their home? Will Mom and Dad be able to handle SIX children without a live-in nanny? What is a nanny? Why would you need a nanny? What would you do someone you loved might move away so that you could not see them every day? What does it mean that “Emma screwed up her face”? Teaching children to talk to adults about their feelings is not always so easy. Had Emma talked to her parents about her feelings, maybe they would have helped her create a safe place in her closet. This would have prevented many problems and headaches. Emma’s dilemma helps children see what can happen when they (and sometimes even adults) try to handle things on their own. Patricia Hermes (http://www.patriciahermes.com/) has written a series of Emma Dilemma books. Although Emma is different from Junie B. Jones and Agnes from The Secret Knock Club, readers will see many similarities. Emma’s relationship with her brother Tim and their adventures will appeal to both girls and boys. Even parents might learn a thing or two. 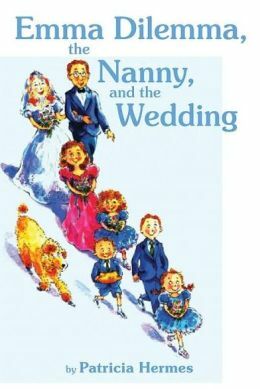 A unique graphic novel for the younger set. If you are plagued by nightmares, write a letter, put it under your pillow and help will come. Three fluffy sheep will rescue the sleeper from their dream and turn it into something the dreamer can handle, maybe even enjoy. A little girl dreams about lots and lots of mice, but she is rescued by the sheep and taken to a safe house. They give her an inflatable catamaran to float over the sea of mice and send her home. Yet, the sheep are getting old and these nightly adventures are taking their toll. They decide to train the next generation of rescuers. The first new rescuer is concocted out of a well-loved quilt into a plump, rather timid bear named Bonifacius or Bonno for short. The sheep take Bonno out the very next night for his rescue-in-training. This time the dream is a falling one. They land on a plane that looks like a pterodactyl that the dreamer learns to fly. The next day, the sheep make a sock monkey to be his teammate. Bonno is sure that Amali the sock monkey is a better rescuer because she seems to do everything right. Next, they conjure up their final rescue helper, Sophia, a crow with a writing quill for a head. Just in time because they have someone with a Naked in Public dream. They all get clothes to wear and Bonno adopts his signature costume, a Mexican wrestler’s mask. Through all of these challenges, the new team learns to solve the scary dreams with their own inimitable style. Young readers want to jump on the graphic novel bandwagon like their older peers but often the stories are not appropriate for them. This one is written with them in mind concerning a struggle many of them face: bad dreams. 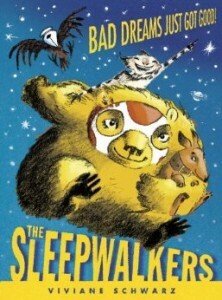 The characters grow and mature as they gain the confidence required to do their “job”, as well as helping the dreamers solve their sleep problems. The graphic novel format is really difficult to read aloud unless you do it one-on-one. This has a fairly easy reading level, so a third grader could read this to a younger reader such as a Reading Buddy and both would have the time to examine each frame.